Florida: The Future of Maryland’s Coastal Waters? Manatees have been categorized as endangered since 1973. Thanks to restrictions on motorboats in areas where they live and programs to rescue, treat and release them, their numbers have surged back, from 1,000 about 30 years ago to about 5,000 today. A couple of years ago, U.S. Fish and Wildlife Service officials even talked about changing the manatee’s status from endangered to threatened. Budget constraints and other projects took precedence and such efforts were tabled. As it turns out, this has been for the better: in the past few years, manatees have been dying in alarming numbers. In 2010, 282 succumbed to unusually cold temperatures. Starting this past September, toxins from red tide — the recurring algae bloom that was worse than usual in southwest Florida, covering 130,000 acres — took the lives of 272 manatees. In addition, restrictions on motorboats do not mean that manatees are entirely safe. About 80 to 100 die every year after being hit by boats. With 2013 about half over, around 600 manatees have died so far. In contrast, only 392 manatee deaths were recorded in 2012. A federal researcher has pinpointed a toxic algae bloom in the Indian River lagoon as connected to the deaths of some 151 manatees, as well as to those of 51 dolphins and 300 pelicans. The algae blooms kill the seagrass which is a mainstay of the manatees’ diet. The manatees then end up eating seaweed, which proves deadly as toxins are affixed to it. Indeed, some dead manatees have been found with food still in their mouths and digestive tracts. Researchers have discovered that they have been eating macroalgae, a kind of seaweed. While it is not usually toxic for manatees, scientists suspect something in the sediment in the lagoon, or even from the algae itself, could be rendering it lethal for them. The dolphins and pelicans seem to be starving to death: as Megan Stolen, a biologist with Hubbs-Sea World Research Institute, says, 85 percent of the bodies of dolphins that she and her team have found are “skin and bones.” Scientists are speculating that their fish stocks could be depleted, or that they have been sickened by parasites, toxins or disease. In another twist to the mysterious deaths of the manatees and dolphins, some other animals that eat sea grass such as sea turtles have not been affected. Neither have bull sharks, which scavenge dolphin carcasses. How Did Florida’s Lagoons Become Toxic Algae Pools? The Indian River Lagoon was designated as an “estuary of national significance” by the EPA in 1990. It runs 156 miles along the eastern coast of Florida and, while only six feet deep, some 3,500 species of wildlife and plants make it their home. As Wired.com notes, the barrier island complex brings in more than $3.7 billion annually from citrus farming, fisheries, recreation, and employment. Scientists are still trying to figure out how the toxins got into the Indian River Lagoon. Authorities are undertaking a multi-year, $3.7 million protection initiative in an effort to halt the lagoon’s slide from unique ecosystem to an algae-ridden site. The culprit seems to be a too-familiar one, developments that, over decades, have turned the lagoon into “the drainage pool for leaking septic tanks, polluted streams, and storm water rich with nutrients from fertilizers.” As there are no tides “to push the water around and flush it out,” pollutants and sediments have accumulated in its waters. Meanwhile, yet another waterway in Florida, Mosquito Lagoon, is covered in a brown algae bloom. As environmentalists and Florida newspapers point out, such algae blooms are yet another sign that Florida has so far failed to enact tougher environmental regulations to protect its waterways. Algae blooms are estimated to result in economic losses of around $230 to $470 million. Nonetheless, Florida governor Rick Scott vetoed a $2 million grant for the Harbor Branch Oceanographic Institute to study Mosquito Lagoon and find out why its water are now the color of a paper bag. It goes without saying that it is sadly fortuitous that the Fish and Wildlife Service never got around to reclassifying manatees as threatened rather than extinct. 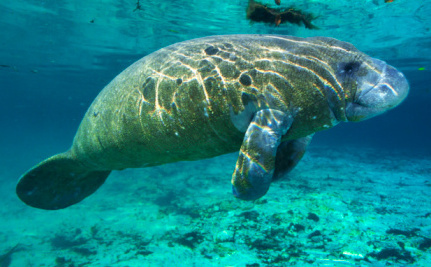 If officials do not act fast to restore, protect and preserve Florida’s lagoons and stop the current and long-term damage to its marine ecosystems, the manatees’ comeback over the past three decades could be over.